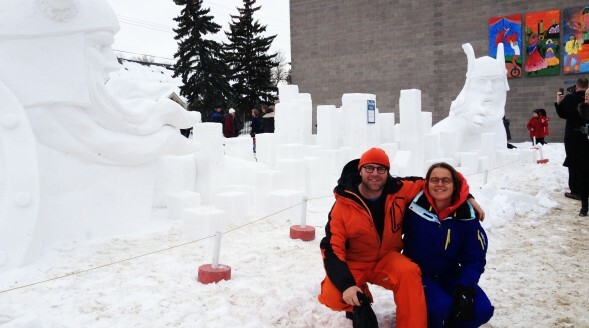 SJI is proud to be providing residence to Wilfred Stijger and Edith Van de Wetering, sculpture artists who recently participated in the city’s Deep Freeze Festival Chisel and Chainsaw Ice Carving Competition on January 11-12. Stijger is a well-known sculptor from The Netherlands. His mediums include sand, ice, snow, wood, and other synthetic materials. He has been sculpting since 1986 and has been participating in countless international competitions for over 18 years. Van de Wetering, also from The Netherlands, began sand sculpting in 1993 and is the owner of Art of Edith. She has won a number of awards for her artwork and has traveled the world for several years in partnership with Stijger. The two developed a Viking-themed snow sculpture during the Deep Freeze Festival on 118 Avenue. Currently in the seventh year of its run, the Deep Freeze Festival closes down four blocks on 118 Avenue to celebrate the Russian/Ukrainian “Olde New Year” and embrace Edmonton’s cold northern climate with outdoor events and winter-themed activities. This year’s theme was “The Vikings are coming!” and offered opportunities for artists and attendees to truly celebrate the northern weather with art, ethnic education, and performance. Find more information on the festival at deepfreezefest.ca. Find more information about Stijger and Van de Wetering’s artwork at stijgerart.nl.